The occasion that brings us together today is always particularly moving. The holy feast of Christmas is almost upon us and it prompts the great family of the Roman Curia to come together for a gracious exchange of greetings, as we wish one another a joyful and spiritually fruitful celebration of this feast of the God who became flesh and established his dwelling in our midst (cf. Jn 1:14). For me, this is an occasion not only to offer you my personal good wishes, but also to express my gratitude and that of the Church to each one of you for your generous service; I ask you to convey this to all the co-workers of our extended family. I offer particular thanks to the Dean of the College, Cardinal Angelo Sodano, who has given voice to the sentiments of all present and of all who work in the various offices of the Curia and the Governorate, including those whose apostolate is carried out in the Pontifical Representations throughout the world. All of us are committed to spreading throughout the world the resounding message that the angels proclaimed that night in Bethlehem, “Glory to God in the highest and on earth peace to people of good will” (Lk 2:14), so as to bring joy and hope to our world. As this year draws to a close, Europe is undergoing an economic and financial crisis, which is ultimately based on the ethical crisis looming over the Old Continent. Even if such values as solidarity, commitment to one’s neighbour and responsibility towards the poor and suffering are largely uncontroversial, still the motivation is often lacking for individuals and large sectors of society to practise renunciation and make sacrifices. Perception and will do not necessarily go hand in hand. In defending personal interests, the will obscures perception, and perception thus weakened is unable to stiffen the will. In this sense, some quite fundamental questions emerge from this crisis: where is the light that is capable of illuminating our perception not merely with general ideas, but with concrete imperatives? Where is the force that draws the will upwards? These are questions that must be answered by our proclamation of the Gospel, by the new evangelization, so that message may become event, so that proclamation may lead to life. The key theme of this year, and of the years ahead, is this: how do we proclaim the Gospel today? How can faith as a living force become a reality today? The ecclesial events of the outgoing year were all ultimately related to this theme. There were the journeys to Croatia, to the World Youth Day in Spain, to my home country of Germany, and finally to Africa – Benin – for the consignment of the Post-Synodal document on justice, peace and reconciliation, which should now lead to concrete results in the various local churches. Equally memorable were the journeys to Venice, to San Marino, to the Eucharistic Congress in Ancona, and to Calabria. And finally there was the important day of encounter in Assisi for religions and for people who in whatever way are searching for truth and peace, representing a new step forward in the pilgrimage towards truth and peace. The establishment of the Pontifical Council for the New Evangelization is at the same time a pointer towards next year’s Synod on the same theme. The Year of Faith, commemorating the beginning of the Council fifty years ago, also belongs in this context. Each of these events had its own particular characteristics. In Germany, where the Reformation began, the ecumenical question, with all its trials and hopes, naturally assumed particular importance. Intimately linked to this, at the focal point of the debate, the question that arises repeatedly is this: what is reform of the Church? How does it take place? What are its paths and its goals? 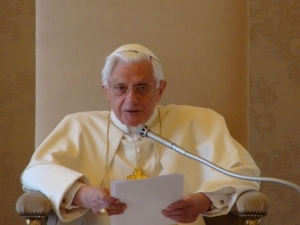 Not only faithful believers but also outside observers are noticing with concern that regular churchgoers are growing older all the time and that their number is constantly diminishing; that recruitment of priests is stagnating; that scepticism and unbelief are growing. What, then, are we to do? There are endless debates over what must be done in order to reverse the trend. There is no doubt that a variety of things need to be done. But action alone fails to resolve the matter. The essence of the crisis of the Church in Europe – as I argued in Freiburg – is the crisis of faith. If we find no answer to this, if faith does not take on new life, deep conviction and real strength from the encounter with Jesus Christ, then all other reforms will remain ineffective. On this point, the encounter with Africa’s joyful passion for faith brought great encouragement. None of the faith fatigue that is so prevalent here, none of the oft-encountered sense of having had enough of Christianity was detectable there. Amid all the problems, sufferings and trials that Africa clearly experiences, one could still sense the people’s joy in being Christian, buoyed up by inner happiness at knowing Christ and belonging to his Church. From this joy comes also the strength to serve Christ in hard-pressed situations of human suffering, the strength to put oneself at his disposal, without looking round for one’s own advantage. Encountering this faith that is so ready to sacrifice and so full of happiness is a powerful remedy against fatigue with Christianity such as we are experiencing in Europe today. A further remedy against faith fatigue was the wonderful experience of World Youth Day in Madrid. This was new evangelization put into practice. Again and again at World Youth Days, a new, more youthful form of Christianity can be seen, something I would describe under five headings. Firstly, there is a new experience of catholicity, of the Church’s universality. This is what struck the young people and all the participants quite directly: we come from every continent, but although we have never met one another, we know one another. We speak different languages, we have different ways of life and different cultural backgrounds, yet we are immediately united as one great family. Outward separation and difference is relativized. We are all moved by the one Lord Jesus Christ, in whom true humanity and at the same time the face of God himself is revealed to us. We pray in the same way. The same inner encounter with Jesus Christ has stamped us deep within with the same structure of intellect, will and heart. And finally, our common liturgy speaks to our hearts and unites us in a vast family. In this setting, to say that all humanity are brothers and sisters is not merely an idea: it becomes a real shared experience, generating joy. And so we have also understood quite concretely: despite all trials and times of darkness, it is a wonderful thing to belong to the worldwide Church that the Lord has given to us. From this derives a new way of living our humanity, our Christianity. For me, one of the most important experiences of those days was the meeting with the World Youth Day volunteers: about 20,000 young people, all of whom devoted weeks or months of their lives to working on the technical, organizational and material preparations for World Youth Day, and who thus made it possible for the whole event to run smoothly. Those who give their time always give a part of their lives. At the end of the day, these young people were visibly and tangibly filled with a great sense of happiness: their time had meaning; in giving of their time and labour, they had found time, they had found life. And here something fundamental became clear to me: these young people had given a part of their lives in faith, not because it was asked of them, not in order to attain Heaven, nor in order to escape the danger of Hell. They did not do it in order to find fulfilment. They were not looking round for themselves. There came into my mind the image of Lot’s wife, who by looking round was turned into a pillar of salt. How often the life of Christians is determined by the fact that first and foremost they look out for themselves, they do good, so to speak, for themselves. And how great is the temptation of all people to be concerned primarily for themselves; to look round for themselves and in the process to become inwardly empty, to become “pillars of salt”. But here it was not a matter of seeking fulfilment or wanting to live one’s life for oneself. These young people did good, even at a cost, even if it demanded sacrifice, simply because it is a wonderful thing to do good, to be there for others. All it needs is the courage to make the leap. Prior to all of this is the encounter with Jesus Christ, inflaming us with love for God and for others, and freeing us from seeking our own ego. In the words of a prayer attributed to Saint Francis Xavier: I do good, not that I may come to Heaven thereby and not because otherwise you could cast me into Hell. I do it because of you, my King and my Lord. I came across this same attitude in Africa too, for example among the Sisters of Mother Teresa, who devote themselves to abandoned, sick, poor and suffering children, without asking anything for themselves, thus becoming inwardly rich and free. This is the genuinely Christian attitude. Equally unforgettable for me was the encounter with handicapped young people in the Saint Joseph Centre in Madrid, where I encountered the same readiness to put oneself at the disposal of others – a readiness that is ultimately derived from encounter with Christ, who gave himself for us. A third element, that has an increasingly natural and central place in World Youth Days and in the spirituality that arises from them, is adoration. I still look back to that unforgettable moment during my visit to the United Kingdom, when tens of thousands of predominantly young people in Hyde Park responded in eloquent silence to the Lord’s sacramental presence, in adoration. The same thing happened again on a smaller scale in Zagreb and then again in Madrid, after the thunderstorm which almost ruined the whole night vigil through the failure of the microphones. God is indeed ever-present. But again, the physical presence of the risen Christ is something different, something new. The risen Lord enters into our midst. And then we can do no other than say, with Saint Thomas: my Lord and my God! Adoration is primarily an act of faith – the act of faith as such. God is not just some possible or impossible hypothesis concerning the origin of all things. He is present. And if he is present, then I bow down before him. Then my intellect and will and heart open up towards him and from him. In the risen Christ, the incarnate God is present, who suffered for us because he loves us. We enter this certainty of God’s tangible love for us with love in our own hearts. This is adoration, and this then determines my life. Only thus can I celebrate the Eucharist correctly and receive the body of the Lord rightly. A further important element of the World Youth Days is the sacrament of Confession, which is increasingly coming to be seen as an integral part of the experience. Here we recognize that we need forgiveness over and over again, and that forgiveness brings responsibility. Openness to love is present in man, implanted in him by the Creator, together with the capacity to respond to God in faith. But also present, in consequence of man’s sinful history (Church teaching speaks of original sin) is the tendency that is opposed to love – the tendency towards selfishness, towards becoming closed in on oneself, in fact towards evil. Again and again my soul is tarnished by this downward gravitational pull that is present within me. Therefore we need the humility that constantly asks God for forgiveness, that seeks purification and awakens in us the counterforce, the positive force of the Creator, to draw us upwards. Finally, I would like to speak of one last feature, not to be overlooked, of the spirituality of World Youth Days, namely joy. Where does it come from? How is it to be explained? Certainly, there are many factors at work here. But in my view, the crucial one is this certainty, based on faith: I am wanted; I have a task; I am accepted, I am loved. Joseph Pieper, in his book on love, has shown that man can only accept himself if he is accepted by another. He needs the other’s presence, saying to him, with more than words: it is good that you exist. Only from the You can the I come into itself. Only if it is accepted, can it accept itself. Those who are unloved cannot even love themselves. This sense of being accepted comes in the first instance from other human beings. But all human acceptance is fragile. Ultimately we need a sense of being accepted unconditionally. Only if God accepts me, and I become convinced of this, do I know definitively: it is good that I exist. It is good to be a human being. If ever man’s sense of being accepted and loved by God is lost, then there is no longer any answer to the question whether to be a human being is good at all. Doubt concerning human existence becomes more and more insurmountable. Where doubt over God becomes prevalent, then doubt over humanity follows inevitably. We see today how widely this doubt is spreading. We see it in the joylessness, in the inner sadness, that can be read on so many human faces today. Only faith gives me the conviction: it is good that I exist. It is good to be a human being, even in hard times. Faith makes one happy from deep within. That is one of the wonderful experiences of World Youth Days. It would take too long now to go into detail concerning the encounter in Assisi, as the significance of the event would warrant. Let us simply thank God, that as representatives of the world’s religions and as representatives of thinking in search of truth, we were able to meet that day in a climate of friendship and mutual respect, in love for the truth and in shared responsibility for peace. So let us hope that, from this encounter, a new willingness to serve peace, reconciliation and justice has emerged. As I conclude, I would like to thank all of you from my heart for shouldering the common mission that the Lord has given us as witnesses to his truth, and I wish all of you the joy that God wanted to bestow upon us through the incarnation of his Son. A blessed Christmas to you all!